The least common multiple is the smallest positive integer that is divisible by both given numbers. If either a or b is 0, LCM is defined to be zero. It is denoted by LCM. The LCM of relative prime numbers is the product of those numbers. The Least Common Multiple (LCM) of a group of numbers is the smallest number that is a multiple of all the numbers. For instance, the LCM of 16 and 20 is 80; 80 is the smallest number that is both a multiple of 16 and a multiple of 20. You can find the LCM of two or more numbers through various methods. This is an ideal method for larger numbers.This method is factoring both numbers down to the prime numbers that are multiplied to create that number as a product. Since 2 occurs twice, you'll have to multiply it twice. Here's what you should do to find the LCM: 2 x 2 x 3 x 5 x 7 = 420. 1. What is the LCM of 2 and 3? 1. Find the LCM of 15 and 25. We have to find prime factors that occurs the maximum number of times in any of the numbers. Now do the product of the prime factors that you found the maximum number of times in both numbers. The LCM of 15 and 25 is 75. 1. Find the LCM of 20, 28 and 25. The prime factor 2 appears maximum number of two times in the prime factorization of 20 and 28. We will take 2 × 2. In the prime factorization of 25, the prime factor 5 appears two times. Now do the product of the prime factors that you found the maximum number of times in each of numbers. 1.Find the LCM of 6, 8. The prime factor 2 appears maximum number of four times in the prime factorization of 6 and 8. We will take 2 × 2 x 2. The LCM of 6 and 8 is 24. 1.Find the LCM of 8 and 12. The prime factor 2 appears maximum number of five times in the prime factorization of 8 and 12. We will take 2 × 2 x 2. The LCM of 8 and 12 is 24. 1.Find the LCM of 9 and 12. The prime factor 3 appears maximum number of three times in the prime factorization of 9 and 12. We will take 3 x 3. The LCM of 9 and 12 is 36. 1.Find the LCM of 6 and 9. The prime factor 3 appears maximum number of three times in the prime factorization of 6 and 9. We will take 3 x 3. The LCM of 6 and 9 is 18. 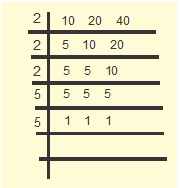 Write the numbers at the top of the Common Factors Grid (as shown in the example). Leave a small space to the left of the numbers and as much space as you can below the numbers. Let's say we're working with the numbers 18, 12, and 30. Just write each number down in its own row at the top of the grid. Write the lowest common prime factor of the numbers in the space to the left. Just look out for the smallest prime factor (such as 2, 3, or 5) that you can pull out of all the numbers. They're all even, so you can pull out 2. 18/2 = 9, so write 9 below 18. 12/2 = 6, so write 6 below 12. 30/2 = 15, so write 15 below 30. Repeat the process of pulling out and dividing by the lowest prime factor until no more common factors exist. Just repeat the process from the previous steps using the numbers 9, 6, and 15 this time. 9/3 = 3, so write a 3 below the 9; 6/3 = 2, so write a 2 below the 6; 15/3 = 5 so write a 5 below the 15. If two of the numbers still share a prime common factor, then continue the process until no pair of bottom numbers have a common factor. In this particular example, you're done. For example, if the bottom three numbers are 2, 39, and 122, divide 2 and 122 by 2 leaving the new bottom row as 1, 39, and 61. Multiply all the numbers of the first column containing the common prime factors with the numbers at the bottoms of all the other columns. This is the LCM. In this example, the product of the common factor column is 6 (2 x 3). Multiply 6 by the numbers at the bottoms of the other columns: 6 x 3 x 2 x 5 = 180. The LCM of 18, 12, and 30 is 180. 1.Find the LCM of 10, 20, and 40 by Division Method. If we first divide the numbers 10, 20 and 40 by 2. We get the quotient 5, 10, 20. Keep on dividing the quotient with 2, 3 and 5 respectively until you get 1 in the all row at last. Now multiply all the divisors to get LCM of given numbers. LCM of 10, 20 < 40 is 200. Two small containers contain 250 litres and 550 litres of water respectively. Find the minimum capacity of a tanker which can hold the water from both the containers when used an exact number of times. We required the tanker that has minimum capacity to hold the water from both water containers in an exact number of times. The minimum capacity of such a tanker is LCM of 250 and 550. We can find it by division method also. LCM of 250 and 550 is 2750. Therefore, minimum capacity of such a tanker is 2750 litres. The first container will fill the tanker by 11 times and the second will by 5 times. The LCM of more than two integers is the smallest integer that is divisible by each of them. 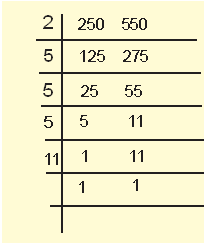 Common multiples are the numbers that are in lists of each numbers given. For two prime numbers a, b; can LCM will be bigger than their product or smaller than their product or to similar to their product? Can LCM be ever equal to one of the number given out of 2 numbers x < y? If yes, explain the scenario?